Part of what I do, as an Evergreen SGV missionary with Asian Access, is to help leaders learn some simple yet powerful ways to capture an understanding of God’s plan for their church, organization or movement. In the book of Jeremiah, God says, “But if they had stood in my council, then they would have proclaimed my words to my people”(Jeremiah 23:22). Strategic planning, if it is to be strategic and if it is to be a plan worth more than the paper it is printed on, must start by standing in God’s council. But if we do start there, then amazing things can happen as we learn to align ourselves with God’s purposes. 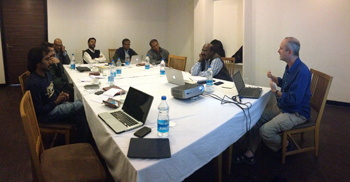 Last month I had the opportunity to work on strategic planning with a group of pastors in India who guide the work Asian Access is doing in the North and South regions of the country. This was my first trip to India, though Asian Access has been there for over ten years. We had a wonderful four days together working on capturing their strategic plan (and eating some great Indian food!). I was glad to see how these amazing leaders sought the Lord and developed a plan to identify, develop and mobilize kingdom leaders to multiply churches and transform communities. Their vision to see leaders with vision, character and competence impacting every sphere of society comes out of their relationship with God and an understanding of His kingdom purposes. I’m convinced they will succeed, not because of their own power and strength, but because they hear from God and align themselves with what He is doing. They are making a vital difference in India, a country with over a billion people. I’m blessed to play a small part through Asian Access as we help advance the gospel through the community of leaders we bring together throughout Asia.